Machine-made gemstones are created in exactly the same manner as those found in mines, she says. “Lab-grown diamonds are pure carbon; they have the same chemical and optical structure as mined diamonds,” Reinsmith says. “They are graded by the same gemological institutions that use the same four C’s”—cut, color, clarity, and carat. Reinsmith founded Ada Diamonds in 2015, along with her husband, Jason Payne, who said, if he “had proposed to [Reinsmith] with a mined diamond, she would have said no to me.” Research put into finding a ring that would bring him a more affirmative response—a process that he says was not consumer-friendly—eventually led to the founding of their business, Payne says. 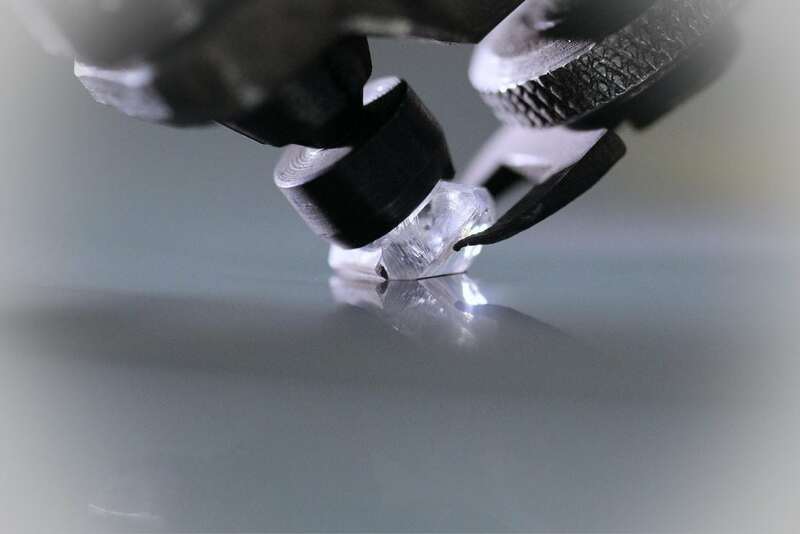 The technology to “grow” diamonds has been around since the 1950s, largely developed for industrial uses such as making drill bits, saws, and sanding equipment. (Diamonds are one of the hardest natural materials and an effective heat conductor, which makes them useful for drilling and grinding.) Essentially, scientists use high-tech machines to mimic Mother Nature’s handiwork by recreating the high temperature and high-pressure conditions under which carbon atoms become diamonds. In 1971, GE developed technology that produced the high quality stones above one-carat in size needed for jewelry, according to Racked, a publication that specializes in retail news. And in recent years, other innovations have enabled those stones to be created in the size and quality needed for high-end jewelry such as engagement rings. Founders of lab-made jewelry companies say concerns over so-called “blood diamonds”—stones that come from mining operations that might use slave labor and result in environmental degradation—are causing buyers to seek alternatives. Price is also a factor; lab-made stones are generally cheaper than those found in nature. The market for manufactured diamonds is still small—the lure of “real” diamonds is very strong—but it’s growing. Sales of rough lab-made diamonds are between $75 million and $220 million, which is around just 1 percent of the global market value of rough diamonds, according to a 2016 report by Morgan Stanley. The firm estimates that that market could increase to 7.5 percent by 2020. That growth is attracting entrepreneurs and investors alike. Ada Diamonds raised about $500,000 in venture capital, the company said, from investors such as Winklevoss Capital. And, in New York, ALTR Created Diamonds was founded by Amish Shah, a third-generation diamond manufacturer. ALTR is a division of R.A. Riam Group, a 100-year-old wholesale jeweler of mined gems. If a custom-designed piece of jewelry isn’t enough, Reinsmith says Ada Diamonds is working on getting a patent for a process to allow people to customize what the rock itself is made of. Dubbed the “Lavoisier” process—named for Antoine-Laurent de Lavoisier, a French scientist who is credited as the father of modern chemistry—the procedure can make diamonds from everyday objects. Ada has made stones from flowers from a wedding party, a PhD invitation, and other sentimental items.